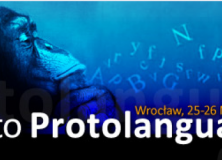 The third Ways to Protolanguage conference has released its call for papers. It will take place in Wrocław, Poland from 25–26 May. The deadline for submission is 31 March. Plenary speakers include Sue Savage-Rumbaugh, Robin Dunbar, Peter Gärdenfors, Josep Call and Tomasz P. Krzeszowski.